737 instructions. How easy is it? Just click and see! 737 Series jets are easy to weigh with our under axle M2000-3-250CS system, this jet was weighed in less than 50 minutes, that included setting up the jacks and scale! First we will want to confirm your main axle point height, there is a differance between new and used tires as well as which type and ply tire you are using. This is important, so as to determine if an adapter will be needed. Here the jack is in place and the cell is contacting the jack point. Note that the extension is not more than one inch on the jack. This aircraft had less than half tread left on the tires, so no adapters were needed. New aircraft or new tires might require an adapter on the jack top or shim plates under the jack. Here the mains are off the ground, we are now checking the level in the wheel well. Checking the level is easy, just plumb bob and check on the right side. Keep in mind, Boeing has an "out of level" chart for correction if you can not get the nose high enough. All you have to do is side to side, if you want to raise the nose to level, then you will use adapters and shim plates which are easy to install, but not necessary. Check your manual for your full procedures and charts. Here you see the nose point with our small cell in place and a 20 ton load tested and machined jack to fit the cell mounting. Note the jack clearance and cell clearance, this install required our smallest adapter, we have three sizes available as well as shim plates to assist with spacing. In not time at all and little effort, the nose is off the ground. Now all wheels are clear, the aircraft is level and its time to read the scale channels. Thats it, now lower and conduct another weighing to ensure the readings match and no miss jacks or alignment issues occured, check the scale for return to zero and your done. Jacks and adapters are available, here you see our 50 ton jack and adapter package. 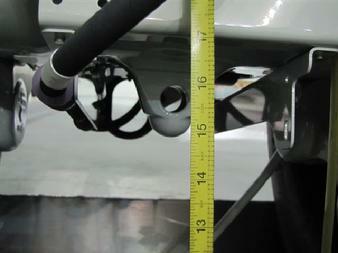 This would be used on an aircraft with high ply or new tires where the axle point has 15.5 inches of axle clearance. On aircraft with worn tires, you just use the jack with no adapter as shown above weighing the 737. This system is not limited to the 737, see our Airbus page, we can do those as well if you have a mixed fleet of aircraft. Our system is one stop and with our adapter package you will have every thing you need to conduct your weighing procedures quickly and in less time than your current set up. We sell both the scale and jack packages, call us for a quote! Large jet scales for under axle, under wing and fuselage are available. Check out our pages and see all the kits we have and combinations. We have systems for the new 787 and supplied kits directly to Boeing, a scale system that did not exist two years ago! Have a special project, OEM weighing requirement, ultra precision quality requirement? Call or email us, we will help you complete your plan and get it done right.